Who in the world does not love cookies? Everybody has grown up with a few cookies as their favorite. I have grown up with a famous cookie called Parle G; we call them glucose biscuits too. It is really tasty like shortbread. Also it is one of world largest selling cookies. We call them biscuits which is no relation with any breakfast biscuits that we get over here. Usually amma will give when we back from school and having tea or coffee. Nowadays I buy Parle G from Indian store and keep it as emergency snack on our car trips. However instead of biscuits my princess call them crackers or cookies as she is busy working in back seat while her papa or mama is driving the car. And her little brother will be crying as he is bored sitting in the car seat. After I started baking I tried oat meal cookies, peanut butter cookies, and chocolate chips cookies. I love to try various combos and various tastes which are not possible to get it in the store. So I am excited as this month we Baking Partners did a theme for our baking partner challenge that is cookies; we have 3 cookie recipes to try from our incredible partners. I tried all three. Since I had some cream cheese left from making cream cheese Chantilly, I thought I will try ultimate chocolate cream cheese cookies first. They are every chocolate lovers dream and ultimate, cake like soft cookies, will have lingering taste you love to remember even after it is finished. We love it. Then next come cornflake cookies, for that I need some cornflakes. However in my house no takers for ordinary cornflakes, my princess won’t eat them but like to play with it and invite all the ants around world into the home. So I stopped buying them. But she likes Post Great Grains cereal, which are not really cornflakes. So I used post great grain cranberry almond crunch which is in my hand. It turned out great. I loved most, and got the chance to finish the entire batch. 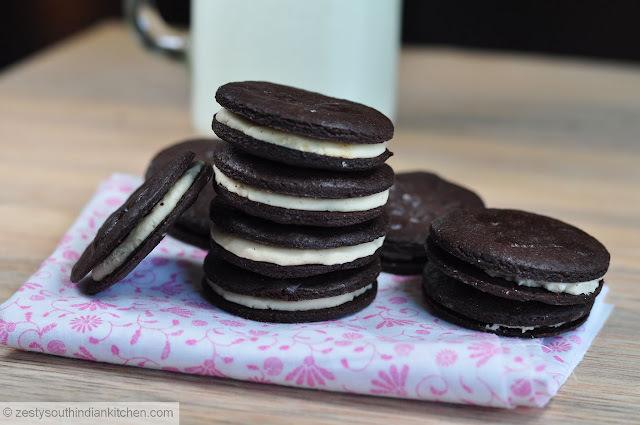 Next I made homemade Oreo cookies, for that I even bought a packet of Oreo cookies to compare the taste. However, I failed and Oreo won. It turned out to be slightly on the bitter side. May be because I used dutch cocoa. So I have to use slightly heavily on filling resulting in a big no from my husband; but my princess loved the filing. I again got the chance to finish lots of cookies. I halved all the three recipes and made approximately around 25 cookies each. It is really easy to put together. I try to spaced the time so that we can enjoy the cookies, however, I got bonus in most of the case. Please take a look at each baking partners contribution as they are different in their look and story behind them is different, even though it is came from same recipe. Some partners are creative in changing them into egg- less versions. Here I am presenting the Ultimate cream cheese cookies, take a look at it. If possible try it; you are going to be in chocolate dream. I will post the rest of recipes in separate posts. Here go the recipe. First grab the ingredients from the pantry. Melt chocolate in a small bowl by microwave them for 25 seconds and set aside. Stir well to ensure the uniform melting. Sift, flour, cocoa powder, salt, baking soda and set aside. In a bowl stand mixer fitted with paddle attachment cream butter and sugar and then add egg and heavy cream and stir once again to combine everything thing. To this fold in melted chocolate and chocolate chips. Wrap with plastic wrap and refrigerate for about 2 hours. By the end of refrigeration, preheat oven to 350 F and line the cookie sheet with parchment paper. Scoop about 1 tablespoon of cookie dough and slightly flatten them with hand. Leave 2 inches in between. Bake the cookies for about 12 minutes until they set in center. Remove from the oven and leave it in cookie sheet for about 5 minutes. Then transfer them to cooling rack until cookies cooled completely. Keep the cookies in airtight container for about 3 days, if you lucky it will remain 3 days. In our house it finished with two days. Take a look at it piece. Prep Time 10 minutes + 2 hours refrigeration time. In a medium bowl, sift the flour with the cocoa powder, baking soda and salt. In a bowl of a standing mixer fitted with the paddle, combine the butter, cream cheese, granulated sugar and brown sugar and beat until fluffy, about 3 minutes. Scrape down the sides of the bowl. Beat in the eggs, heavy cream and vanilla until blended. At low speed, beat in the dry ingredients. 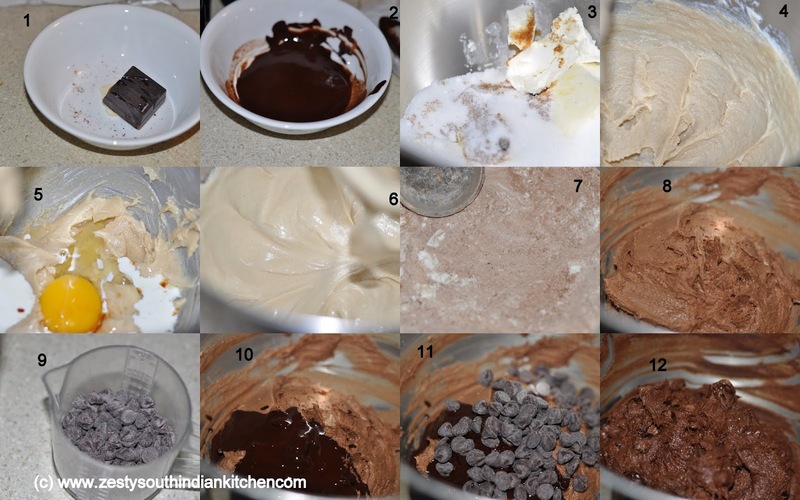 Add the melted chocolate and chocolate chips and beat just until incorporated. Cover the bowl and refrigerate the dough for at least 15 minutes or up to 2 hours. 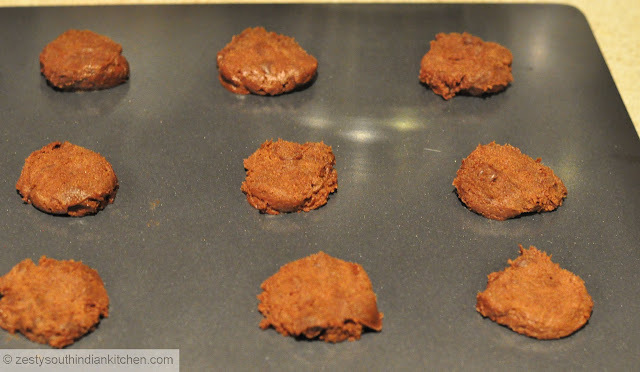 Scoop heaping tablespoons of cookie dough onto the prepared baking sheets, spacing them two inches apart. Bake for 12 minutes until the cookies are just set; shift the baking sheets for top to bottom and front to back half way through. Let the cookies cool on the baking sheets for 5 minutes, then transfer them to a rack to cool completely. Instead of chocolate chips you can try butterscotch chips . Wow all the three cookies look perfect and delicious….Great job dear..
OMG! Your three cookies are absolutely divine, Swathi. 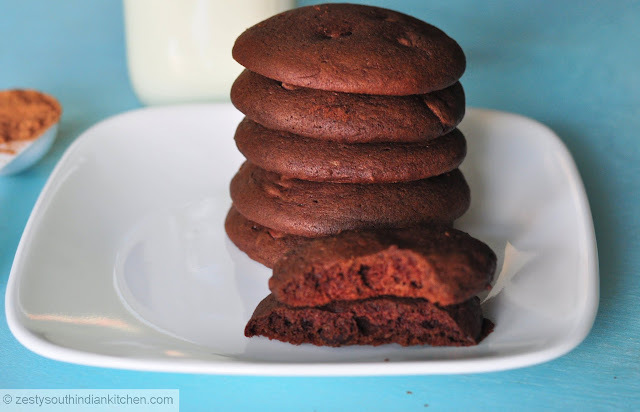 chocolate cream cheese cookies looks wonderful dear. 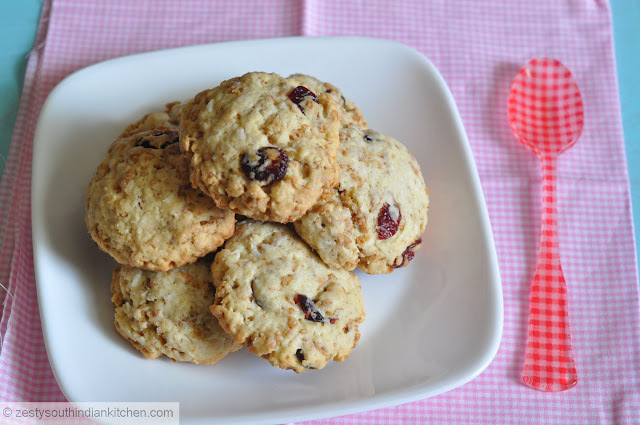 Crunchy munchy canberry mixed conflakes cookies look awesome dear. And homemade oreo cookies are lipsmacking good. Lovely, what a perfection! Wow Swathi,great job dear,all three looks stunning,oreo cookies is superb,exactly like the store brought,you rock dear! Looks too good dear 🙂 Nice clicks!! Woow, These cookies look amazingly good and my family enjoyed all the three. Delicious!! Omg, you have done a beautiful cookies Swathi..they looks mindblowing. Loved all those three cookies you baked.I’ll be making oreo cookies soon.Thanks for this wonderful challenge again. You know that happened in my house too. All cookies are wonderful and shall try the other two soon. So you have been baking this past week. Your cookies does look ultimate which my daughter would want me to make it. My personal choice would be the cranberry almond crunch. Have a great weekend! All the cookies are irresistible Swathi! I am still going to make the other 2 cookies sometime soon. The cream cheese ones look real yummy and I love the cereal you used in the cornflake ones – lots more flavor. My family loves the oreos – we are all happily munching on them tonight for our snack. All the cookies look great. perfectly baked. nice clicks too. Anything that says ‘Ultimate chocolate’ has our vote! What a cookie feast! 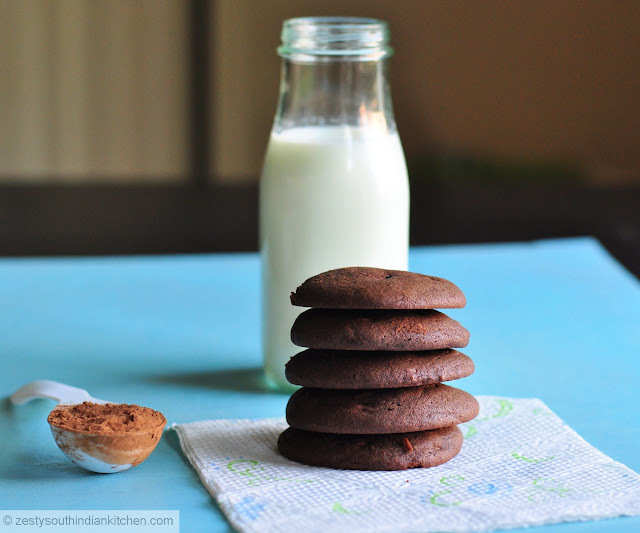 Loved all three cookies,Swathi.. Lovely clicks.. Thanks for this month’s recipes. Wow you made all 3. Great! cookies. I loved the colour of your oreo ones. Thanks for choosing such delicious cookies. Swathi how do u always try to take such amazing pictures.All your cookies look sooooooooooooooooooooooooooooooooooooooooooooooooo good. You have done such a great job with all the three cookies. You have literally nailed the recipes. Loved them !! So perfectly done Swathi, all the three of them look superb.. I wanted to try the chocolate cream but it was not available in my pantry. It looks delish from your pics. By the way, I’m resending my link as entry #28 coz the first one I sent (entry #26) had errors. Swathi, I hope there is a way to delete entry #26. Sorry about that… Thanks! Wow! You made all three cookies! You rock, Swathi! Btw, sorry for linking just now. Busy weekend! Cream cheese and chocolate really goes so well together! I love the pictures with the milk, it would go very well with milk! wow delicious cookies,loved all kinds…thanks for sharing. looks so perfect and delicious..
liked all your clicks 🙂 nice preparation..
wonderful clicks. The cookies look mouthwatering. Beautiful cookies and even more stunning pics. I baked these today and they are beautiful! I love this recipe. I love the idea of cream cheese in cookies. So tasty. Thank you for sharing the recipe! Swathi from the day you had set this challenge I wanted to make the oreos but as it is work I had put it off. My kid remembered these and she made them for the BM that I am participating in. Thanks. It was a proud moment for me to post what she has done. Thans for the awesome recipe.